A “Euclid Wide Survey” covering 15,000 deg2 of the darkest sky. That is, the sky free of contamination by light from our Galaxy and our Solar System. The wide survey is the core of the dark energy mission out of which weak lensing, baryon acoustic oscillation and redshift space distortion signal will be measured. Three “Euclid Deep Fields” about 2 magnitude deeper than the wide survey and covering around 40 deg2 in total will be also observed, primarily for calibrations of the wide survey data but also extending the scientific scope of the mission to faint high redshift galaxies, quasars and AGNs. The sky covered by the two surveys are shown on the first figure below which represents a possible survey model for the mission. 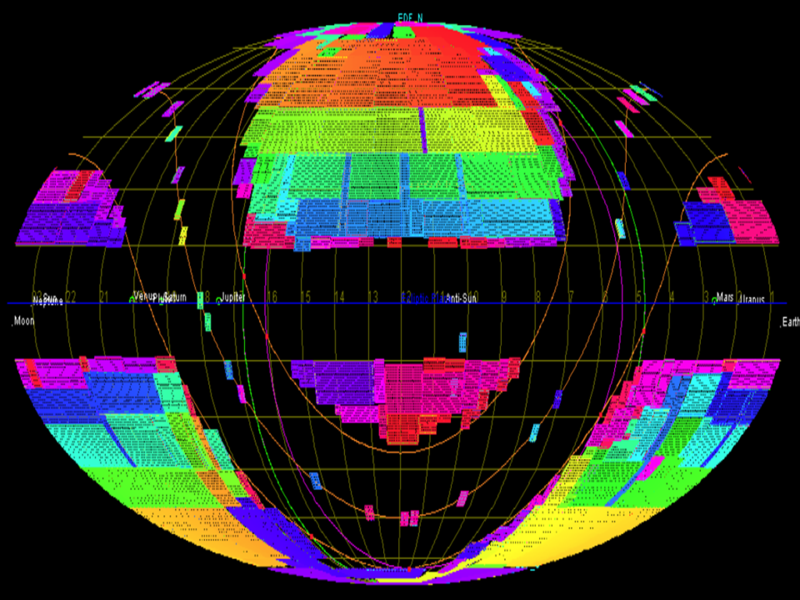 Coloured areas are the sky fields observed with Euclid. Each colour represents a full year of observation. The 6 coloured regions are composed of mosaic of tiles of 0.54 deg2 (VIS and NISP shared field of view). The isolated fields spread over the galactic planes are calibration fields. Observation will be carried out in a step-and-stare mode, where each VIS and NISP observations are completed on a given field prior to move to the next adjacent field. Euclid can then observe a long strip of about 10-20 deg. long per day. Euclid should then provide patches of about 400 deg2 every month. Every 6 month the telescope will be pointed toward the opposite direction in order to survey the other hemisphere.